With Ultra fines (UFP's) and Nano-particles (NP's) being the subject of choice when discussing recent developments in Aerosol and Environmental Monitoring and the expected regulations associated with this exposure, new metrics to measure UFP's and NP's have been developed to quantify this class of compounds. Defining an aerosol concentration can be done utilizing Concentration by Mass, Concentration by Number, or Concentration by Active Surface Area. When utilizing a Concentration by Mass metric, the results appear skewed towards the larger size range because Ultra fines do not contribute a substantial amount to mass in comparison to larger particles. Inversely, when utilizing a Concentration by Number metric, the results appear skewed towards the smaller size range because the majority of the population of environmental aerosols exist within the Ultra Fine range. A Concentration by Area metric gives the user the Active Surface Area (ASA) of the particulates within that known volume and is not subject to the same bias the Concentration by Mass and Number yield. The Lung Deposited Surface Area (LDSA) brings the relevance of the associated health effects into the ASA metric. The LDSA is the concentration of aerosol expected to deposit in the lungs after inhalation based on the size of the particulates in the aerosol. 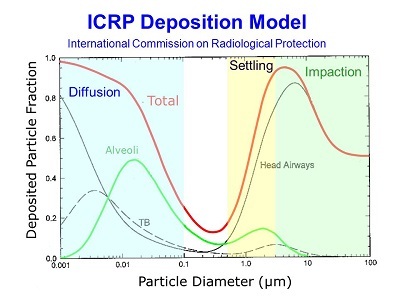 The figure to the right shows a model of the deposition as a function of particle size thanks to the International Commission of Radiological Protection. Levin, Marcus, Olivier Witschger, Sébastien Bau, Elzbieta Jankowska, Ismo K. Koponen, Antti J. Koivisto, Per A. Clausen, Alexander Jensen, Kristian Mølhave, Christof Asbach, and Keld A. Jensen. "Can We Trust Real Time Measurements of Lung Deposited Surface Area Concentrations in Dust from Powder Nanomaterials?" Aerosol and Air Quality Research Aerosol Air Qual. Res. 16.5 (2016): 1105-117. Web. Geiss, Otmar, Ivana Bianchi, and Josefa Barrero-Moreno. "Lung-deposited Surface Area Concentration Measurements in Selected Occupational and Non-occupational Environments." Journal of Aerosol Science 96 (2016): 24-37. Web. Eeftens, Marloes, Harish C. Phuleria, Reto Meier, Inmaculada Aguilera, Elisabetta Corradi, Mark Davey, Regina Ducret-Stich, Martin Fierz, Robert Gehrig, Alex Ineichen, Dirk Keidel, Nicole Probst-Hensch, Martina S. Ragettli, Christian Schindler, Nino Künzli, and Ming-Yi Tsai. "Spatial and Temporal Variability of Ultrafine Particles, NO2, PM2.5, PM2.5 Absorbance, PM10 and PMcoarse in Swiss Study Areas." Atmospheric Environment 111 (2015): 60-70. Web.